I do not disparage those who do not believe in an almighty Creator of all things. That comes from one's personal experience in this journey that we call "LIFE". I have flown above the fluffy clouds with cotton tips and circled around their flossy tufts, while all below was overcast and darkened over. This is no sermon, ... merely one memorable time (but not the first miracle) in my life. For the uninitiated, a flight "circuit" is basically a rectangular path flown to a height of 1000 feet above sea-level around an airport. Most aircraft will take off and fly a whole circuit as small as practical for practice or during training sessions. The size of a circuit will also depend upon the make of the aircraft. 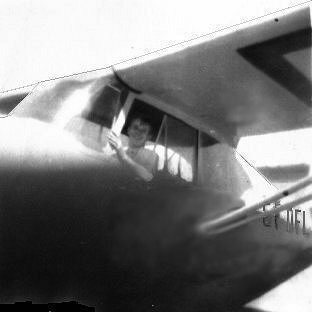 Sunday, May 15, 1949, was a bright, sunny day with plenty of those high, fluffy (alto cumulus) clouds overhead as I bicycled up Stevensons Road intent upon spending most of the day at the airport and flying a couple of practice circuits. Within twenty minutes, I was in the office booking out the high-winged monoplane, single-engined Aeronca, which bore the identification letters "DFL". Contrary to popular belief, there were very few planes at the airport that required a pilot to wear a parachute; the Gypsy Moth and the Harvard Trainer were the only two. DFL seemed to be my plane of choice. Thus, on May 15, after parking the plane on the tarmac at an angle towards possible incoming traffic, I applied the mechanical brakes and eased the throttle forward. The left brake was allowing the plane to veer slightly to the right, but it stayed on the spot; I throttled back, reapplied the brakes, and tried the throttle again with the same result. However, I decided that the brakes would not be a major problem, and taxied onto the runway for a take-off heading east (after noting that the windsock was lazily drooping on the West side of the pole). A circuit usually takes ten minutes, from the take-off to a climb to one thousand feet and from completing the rectangular course to making a landing. Everything was uneventful until I was preparing to land other than a faint whistling sound (just like my instructor, Milt McDougall, used to make when he sensed that I might be making an important decision). When I reached up for the trim-tab knob, it fell clattering to the cockpit floor and bounced around. Well, you make do with whatever is left for you to adjust, so that you don't have to struggle with the stick to make the elevators work. Then, on the approach leg I noticed that the windsock was meandering slightly and blowing out with probably a forty m.p.h. wind from the South-East, but I had landed in stronger winds so I continued down with the throttle back. The trim-tab knob bounced around the cockpit floor some more ... just to let me know that it was there. At about fifteen feet above the ground, everything seems to rush up and every blade of grass comes into focus. At this point a pilot eases the stick back and stalls the airplane for a soft landing. It came as a deep shock to notice that the cushion on the seat was oversized, and the stick would not come back far enough for a stall. The plane would touch down alright, but would bounce up fifteen feet. After a couple of these shocking jolts, on went the throttle for a quick take-off into another circuit and an adjustment to the knobless trim-tab. This time, I decided to adjust the direction of my landing so that I was flying directly towards the windsock; this path led to the grassy field to the right of the runway. Non-runway landings in the grass had been part of my flying instruction. The cushion was still a problem, but with such a strong headwind it was much easier to stall DFL and make a slightly bouncing touchdown. Very little mention was made about the difficulties, but Stu listened as I described the oversized cushion, the bouncing trim-tab knob and the loose brakes. He asked me if I had noticed that George Hurren had fired a flare on my first attempt at landing, and I commented that I was probably already taking off in reaction to the shift in the wind. Fred "Bud" Gimblett, another recent pilot, showed up at about this time, and I decided to try the newest aircraft, the 90 horsepower Aeronca FMX. It was a much more satisfying experience to outpace the slower Aeronca DNO that Fred flew and it gave me an opportunity to shake off the jitters from my previous flight. My next flight, also for 20 minutes, was one month later due to my lack of funds.